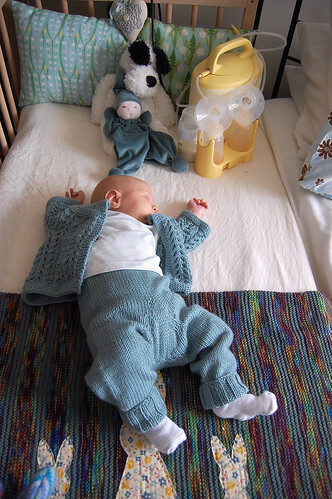 I do love a baby kitted out in yummy woolliness. 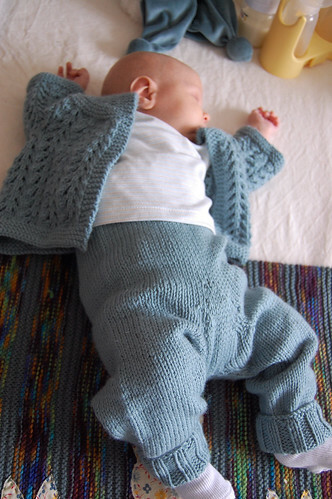 It's bittersweet pulling out things I knitted when pregnant with Florence and then dressing Ernest in them, but oooh he's just so snuggable in these soft wool longies and cardigan. Making use of the bedside crib for a change too. For anyone interested both patterns are Elizabeth Zimmermann, the yarn Debbie Bliss Baby Cashmerino. Anne, a bedside crib has only three sides and fits right up against an adult bed. You can buy them, but we just bought the cheapest crib Ikea make and adjusted it ourselves. Ernest has only napped in it so far, he prefers to be right next to me in our bed. He just looks sooo lovely and very peaceful.